vtdiy, if you go through the trouble of skinning back the covering, then remove the whole bit, replace it with a stiffer section then gusset it. Do the same on the other side. You will be glad you did. That's a common place for s break if you are gonna hand launch! Good luck! No worries! Thanks Crabby, that makes sense. I did wonder about replacing the whole piece, but thought that would just cause problems where I butted it at both ends. Gusseting solves that. Simple! 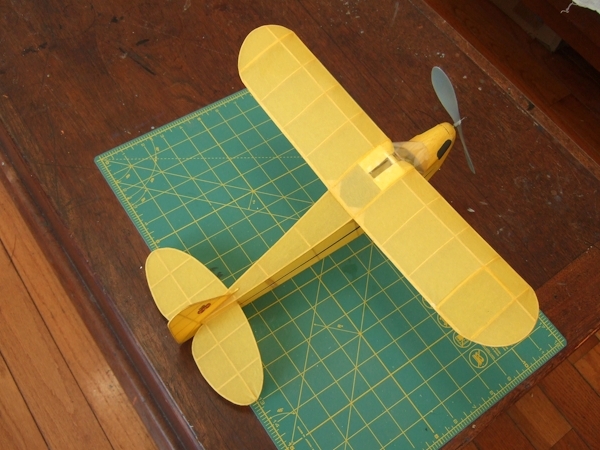 I finished the Bostonian J3 Piper Cub today. Very happy I did! Thanks to Scigs30 and help for this fine design, and Yak52, Lurker, Crabby, and LastWoodsman for advice and encouragement. Weight is 15.7 grams with the prop. Hi LW. it's just Esaki yellow tissue, not doped. Never used it before. The wingspan (just measured to make sure) is 15-7/8" Bostonian rules say 16" max. And it's just a hair under 3" chord -- also just under the rule. so that gives 48 sq. in. I don't know the wing loading exactly because I don't know how much rubber it will use, or if any ballast will be needed. I just have the finished airframe weight (post above). 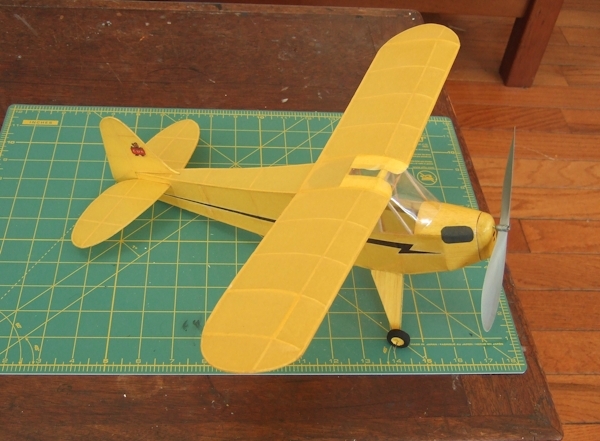 Bostonian rules say that 14 grams is the minimum airframe weight, and I'm 1.7 grams over that as-is. She looks great, hope you have fun flying her.